Cornerstone Orthopaedics and Sports Medicine (Superior) - Book Appointment Online! 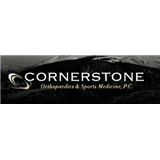 The physicians at Cornerstone Orthopaedics and Sports Medicine, P.C. are highly trained specialists in the field of orthopedic surgery who are committed to excellence through compassionate, quality orthopedic care. We apply the latest technological advances in the treatment of orthopedic conditions. We recommend surgery only when non-surgical techniques have been insufficient for your fullest recovery. If surgery is required, we offer expert state-of-the-art surgical techniques aimed at your rapid return to normal function. Following surgery, we initiate physical therapy as soon as possible and follow you to full recovery. We are committed to community service and pledge our time and expertise to a variety of capacities; including giving community medical seminars, providing team physician coverage for several local high schools, and participating in charity events.